Did you know August 16th was National Rum Day? In my never ending search to find an excuse to drink, National Rum day coinciding with the end of Summer and Back to school is perfect. Whether you’re extremely happy or extremely sad your kids are headed back to the classroom, rum can help you through it. And if you’re like me looking to get one last trip or vacation out of the way before school starts, even better excuse to have a drink. This cocktail comes from Theo Lieberman, head bartender at the famed Milk & Honey in New York. This isn’t your typical rum drink so if you’re expecting a rum & coke or a tiki drink then think again. 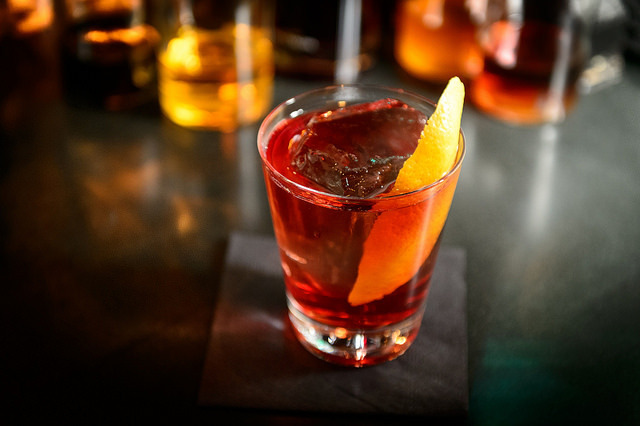 It’s a strong a sophisticated cocktail, similar to a Manhattan that uses Pama, Solera rum, vermouth and bitters. Enjoy the Alcoholiday! Combine ingredients in a mixing glass. Add ice and stir. Strain into a rocks glass with ice. Photo credit courtesy of Filip Wolak, recipe courtesy of Theor Lieberman.